Not a "real" movie update as it is a human update... but Dave Briggs, my co-producer and the President from 'Lead to Di For' had surgery this AM to remove two cancerous growths from his kidney. The kidney was saved and he's recuperating nicely tonight. Just talked to him a couple of hours ago, and he's already wanting to talk about our new film. I sat with him tonight for about 1/2 hour as he slept. He looks great. Full body scan showed no spread, so thank GOD for that. But please keep Dave in your thoughts and prayers for the next few weeks as the recovery will be uphill I'm sure. I'm thankful he has our films to look forward to... that really helps him mend. If anyone wants to send flowers or your love, please let me know. I know he made many friends at Leapback when we were there. I wasn't fortunate enough to attend Leapback and so haven't met Dave or your good self. Nevertheless, he will be in my prayers. Please send him my good wishes for a speedy recovery. Wow - thanks for the update. Do tell him I send along my thoughts and hope he makes a very quick recovery. It was great meeting him at the con. Chris, please send my best wishes and love on to Dave. I pray he has a quick and full recovery. Will he be having chemotherapy or radiation as a follow up to ensure no further spread of the cancer cells? Thanks Marissa, Dave is doing wonderful. He's home and in great spirits. Talked with him tonight as we had many laughs, and of course, talked about how much fun we had in LA for Leapback. *Whew* Glad he's okay, and everything worked out so good. He also added that he hasn't had to take one pain pill since being home! I thought that was fantastic!! Marissa, are you friends with Dave on Facebook? I can send a link if you'd like! Take care, and thanks for all the kind regards. Dave sends his thanks and love! Chris I haven't got Dave on Facebook, I will go through your friends and add him. Glad to hear the good news. For you bit torrent users out there, I uploaded our DVD just now. Its the same DVD we screened at Leapback. Its FREE BABY!!! The file is an ISO file, so if you need help figuring that out, let me know. Wow - very cool - thanks for doing this for everyone! Fantastic, thanks!! I've been anxiously awaiting a DVD quality release of it. If anyone has any questions on how to download this, please feel free to ask. The software I use is Vuze (formerly Azureus) but there are many other such BitTorrent clients as well. P.S. Not everyone has access to TPB. I think you can post the tracker file as an Attachment here on the forums if there is no objection. The file itself is just 12KB. First I hope all is well with you. I know you have had a turbulent year. I've got this Torrent file you've provided but so far I have not been able to download any of the DVD. The problem is nobody is "Seeding" it (offering files). For those who don't know, BitTorrent is a protocol, a way of sharing files between computers. Instead of Chris putting the huge DVD files on his website and letting people download, which would cost him a huge amount of money, instead we can distribute this file through the network of anyone running a BitTorrent program and sharing this file. So for this to get out there, I hope folks will download a program like µTorrent or Vuze and download the Torrent file and leave uTorrent or Vuze running so the file will get distributed. I'll look into that. Thanks for bringing it to my attention, and I'm sorry it took so long to reply. 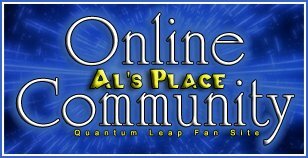 In other good news, "Quantum Leap; A Leap To Di For" was screened locally over the holiday weekend, and lo and behold... WHO might have guessed someone from Roddenberry.com was in attendance, and wrote a GLOWING review, listed on their website. I was rather surprised, and pleased. WOW. You can read the review here. They also reviewed our other fanfilm, Star Trek vs. Batman, which was a HUGE nod for the Trek world. We screened both films at Starbase Indy, and had a wonderful Q &A with the audience immediately after the showings. It was a GREAT turnout, reminding me a lot of our Q&A at Leapback. A good day at the RACSO camp. If more folks will install uTorrent and download the file I listed above, then when you or someone else with the file starts Seeding it, then we'll be able to download it quicker and get it distributed. Here's a GREAT review of our film from SciFiPulse.net!! Awesome! Very well done review - I really enjoyed the film! I have a question though - is the British ambassador in 1997 the same person who talks to the American President in present day? Last edited by Lightning McQueenie; 08-21-2010 at 01:11 AM. Can anyone seed this? A bunch of leechers, but no seeds. So Chris, I've just been reliving some of the fun of "A Leap to Di For". I certainly wouldn't be opposed to it. But as with any film (or project), its going to have to take money, and lots of it. We really did some amazing wheeling and dealing with Leap to Di for, but I doubt we could pull that off again for a few reasons. 1) I am working full time now. 2) I have a three year old son, and my priorities have changed. 3) Getting people to work for free is tough, especially in the crew department. That being said, let's consider this... I'm set to shoot another film this summer, and I'm trying to fund it on Kickstarter. If I can get people talking enough about it, and its successful, I'll definitely put something in motion for QL. Bt the way, can I give a shameless plug here for our new project? *hint hint* We've got some pretty awesome rewards for this one too. I'm giving away all of our costumes from this film, plus all of my Star Trek vs. Batman costumes (nine all together). LOL, I'd work for free just for the experience, but I know nothing of the movie-making biz and would probably get in the way. New movie sounds awesome, by the way! It's had to believe that it was SIX years ago that Chris (Kirok) announced he would be making the fanfilm "A Leap to Di For", and it's had to believe that it was FOUR years ago that it was premiered. I loved going back to the beginning of this thread and re-reading everything - it was like watching a "Making of A Leap to Di For" special haha. And yes, there will be plenty for us Leapers in this! Hit us up at racsocomics.com! Thanks so much! Why yes there is! Here's the link! Had to have a rewatch of ALTDF, and I was so disappointed that Youtube have muted the audio I'm going to have to find my DVD now haha.